But it is not solely dedication to their trade that leads the Spartans to their bloody battle. In the movie’s final scene we watch as united Greeks charge the Persian army. This time, their number far exceeds 300; they are thousands deep and, though still outnumbered, like their odds. In earlier posts, we highlighted how the values driven entrepreneur has the unique opportunity of being a magnet that unlocks passion and points many towards a common purpose. 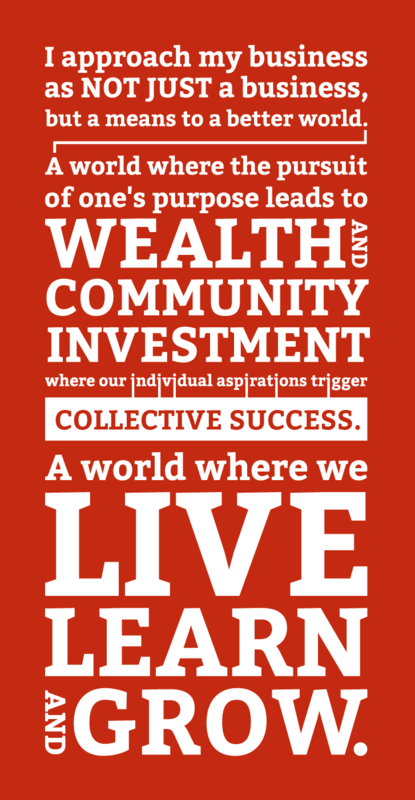 Our last value, BUILD AND SUSTAIN COMMUNITY , is perhaps the most difficult of them all. Up to this point, every value has served as a guide for the values driven entrepreneur to support the goals of her enterprise. Yet the truth is, most values driven entrepreneurs are drawn to solve some of the world’s most intractable problems and, in these cases, there is no chance that any one person or entity can do it alone. Even the Spartan warrior elite, were bolstered by 30,000 other free Greeks in the battle that ultimately ended the Persian invasion and freed Greece. The really big problems— hunger, poverty, the environment—take a community in the truest sense of the word. Take the Strive Together network, which focuses on cradle to career success in education. They pioneered the collective impact model, which recognizes that while the world of education may have consultants, schools, foundations, businesses, and others who care and are deeply passionate about fixing the system, the only way to achieve significant outcomes is to channel all those resources in the same direction. When Jeff Edmondson, CEO of Strive Together, explains this approach, he underscores that it’s not just about moving in the same direction. It’s the difference between separate boats rowing next to each other (collaboration) versus everyone rowing in the same boat (collective impact). This basically means that the values driven entrepreneur must not only acknowledge that he is one of many stakeholders that share a common purpose and passion, but also invest his own resources to build and sustain a sense of community amongst these organizations! To understand the efficacy of this approach, think about King Leonidas. It was absolutely true that his army was head and shoulders above the Arcadian army. So the real question was, what was he fighting for? Did he want to live and die knowing that Sparta was the best City-State? Or did he want to live and die knowing that he and other nations like him deserved freedom from oppression? If it were the former, he and his men would have achieved their goal with honor when they fell on the battlefield. Xerxes had been singlehandedly conquering nations effortlessly and no one he and his army faced ever came close to delaying, much less defeating, him before he encountered the 300 Spartan warriors. But to earn his people’s freedom, King Leonidas had to both believe and invest in those outside the immediate boundaries of his City-State. If you want to achieve the most impact in service of your passion and purpose, here are a few thoughts to keep in mind. You see a problem and believe it can be solved: There are two parts to this, and neither can be taken for granted. If we take the example of education, we see that there are people who believe that the education system is healthy and functioning and is better left as is. There are also people who believe that the system might have its flaws but, given a plethora of factors that vary depending on who holds the opinion, it’s not a problem that can be solved right now. Then there’s the group of people that believe that the education system needs fixing and that it is possible to build one that actually works—not one that is just barely held together with band-aids and workarounds. For problems that are this big, it is nearly impossible to solve them alone. While you may not need a Xerxes-sized army to be victorious, you will need buy-in from people outside yourself and, most likely, these people will also see the problem as well as the promise of a solution. You have one of several solutions: I was first drawn to engineering and math because, for me, it held the promise of clear, determinable solutions. But as I moved into more complex math and science, I began to grapple with the fact that many problems had not one answer but a range of solutions and finding these required peeling back the layers and seeing the gray space that existed beyond the black and white of numbers on a page. The current analogy I’m most comfortable with is baking. I enjoy baking because it is, unlike cooking, more a science than an improvisational art. Barring some extenuating circumstance or unforeseen changes in altitude, I’m usually able to create what I had imagined. When baking a cake, one will most likely need common ingredients- flour, milk, eggs, sugar. But when I reflect even further, it’s more the PURPOSE of those ingredients. When it comes down to it, it’s not that we need sugar, we need something that creates sweetness. And it’s not that we need eggs, we need a binding agent. And so on. But in our current environment, many folks believe so strongly in the effectiveness and superiority of their own recipe, that they forget that their specific ingredients might not work for everyone. If we distill the elements of our approach down to their purpose, then we can have core solutions that can be altered for even the lactose intolerant. And part of making that happen is letting go and believing that other people can understand our recipe and then modify it for their needs, using flavors and ingredients that make it palatable to the families, communities and systems within which they exist. And you are one of several RIGHTFUL leaders: Ben Hecht, CEO of Living Cities, and I were recently in a conversation where we lamented the number of “heroes” entering the social sector (I affectionately call them knights). As opposed to an army of knights on horseback trying to “save” communities, we usually need a round table of leaders of equal standing who recognize they serve a common goal [INSERT PASSION] and leverage a bevy of strengths [INSERT PURPOSE] to achieve it. In this new world, we are family [INSERT POINTER SISTERS] and recognize that an ecosystem of thoughts and actions will bring about the change that we want to see in the world. Because if there’s one thing that this blog continuously harps on, it’s that we have earned the privilege to solve the world’s most pressing problems in a way that does well and demands good. So as a values driven entrepreneur you must ask yourself- are you willing to give as much for others to realize your passion, or do you believe your purpose will only be achieved with you at the helm?